What a find. I have never caught this show before. Sure I know the station - Triangle/Stratos TV is a bit if New Zealand treasure - basically community television with a bit of an edge sitting on one of the more obscure corners of the New Zealand UHF spectrum. 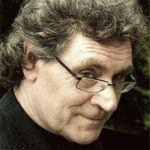 But I had not come across Bomber before, although I'm told he has an impressive track record - ex Craccum, ex Channel Z, ex Alt TV and ex Rip It Up editor. Love him to bits! Especially the no nonsense bias. Much more Bomber here. For those needing more context - believe me, despite the lean to a combined Grey Lynn/Cuba St possie of left/liberalism, this is a totally spot on skit on NZ politics in the last week - MMP review - Auckland Super City logo competition - Christian doctors and abortion - Radio NZ - and of course Prime Minister John Key's relentless and apparently never ending teflon coated relaxed patronage/popularity. 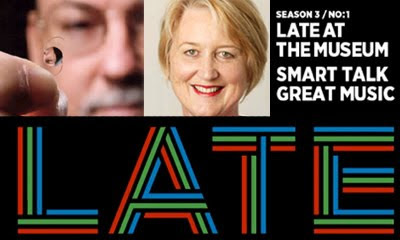 This year's season of LATE at the Auckland Museum events welcomes a year-long investigation into the theme of innovation – featuring panel discussions with leading innovators from NZ as well as local music. Coming up this Thursday, 4th March, Late 01 Innovate Science, investigates "the way science drives the economy and underpins our everyday life. The panel will discuss how science has helped grow NZ , from early ‘Number Eight Wire’ innovations in agriculture, through to atom-splitting and current biotech projects. It will then turn its attention toward where the next real innovation is needed, and hopefully, in the process communicating a greater understanding and passion for science throughout New Zealand. The panel features Dr Helen Anderson alongside inventor, social entrepreneur and ‘New Zealander of the Year’, Ray Avery. Dr Helen Anderson is chief executive of MORST, The NZ Ministry of Research Science and Technology. She sees her role as helping research, science and technology improve New Zealand. She is credited with playing ' a central role in determining high level science priorities, enhancing New Zealand's research infrastructure, and encouraging greater private sector research and development"
Ray Avery was recently announced as ‘New Zealander of the Year’by Prime Minister John Key, recognising his contribution to the nation through science and technology. Avery is the founder of independent development agency Medicine Mondiale, which creates low-cost solutions to health issues in the developing world. It would appear that serendipity over my last few posts - on Trollope - BL 19th century writing - New Zealand early texts and the fate of the people and places destroyed by the Tarawera disruption - just goes on. "In June 1886 Mt Tarawera spectacularly and disastrously erupted, and this documentary tells the story of the people who were caught in the catastrophic events. 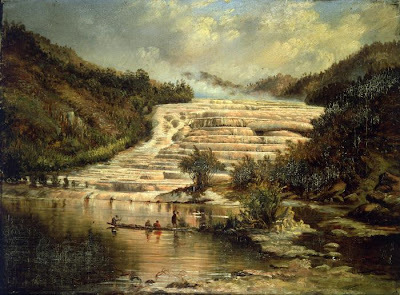 Around 120 people lost their lives, and the internationally famous Pink and White Terraces were destroyed. The documentary features an animated re-creation of the eruption, archival images, interviews with descendants of those involved, and readings from written eyewitness accounts. The author of the book Tarawera, Ron Keam, is also interviewed..."
New Zealanders will recognize the narrative voice of veteran director Ian Mune who, years ago, at the height of his exposure around the End of the Golden Weather once sent me a three page critique of a unsolicited movie idea I sent him. Lovely lovely man whose generosity of spirit totally inspired me. Still does! Got room for 65,000 19th century classics? The British Library has taken the welcome step of making their archive of 65,000 19th century classics available as free downloads on the Amazon Kindle. Originally digitised in partnership with Microsoft Livesearch, the British Library’s new deal with Amazon will unlock 65,000 editions of 19th century philosophy, history, poetry and literature – over 25 million pages of content. The arrangement covers Amazon's sites in US, the UK, France and Germany. 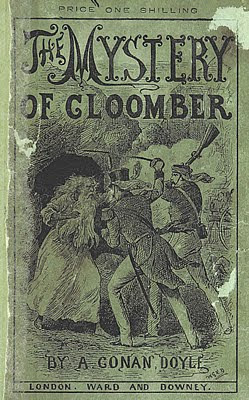 The BL says of the initiative, "covering the likes of Dickens, Austen, and Conan Doyle, the 65,000 titles also include a range of lesser know Victorian classics such as, A Strange Story by Edward Lytton, one of the period's most popular novelists - now largely neglected, and The Story of a Modern Woman by Ella Hepworth Dixon, described as 'the greatest unread novel of female struggle'. " This of course will only be of marginal interest to people in New Zealand - because, unlike the likes of their tiny neighbours in the Pacific, Kiribati, Fiji, New Caledonia, Tuvalu, and even the Cook Islands, the Kindle is not available here. And, there doesn't seem to be any plans to change that? I would especailly like to understand how mere mortals in the colonies can get a hold of the BL ones mentioned above? And yes, advice, help, gratefully received. Auckland Museum continues to make measured and iterative steps towards a world class digital footprint which emulates the Smithsonian belief that a Museum web site should go for the same depth of relationship online as they try for in the physical building. Just launched - I AM Making Movies - a competition which invites Year 5 - 13 students to create a short movie based on exhibits throughout the Museum. The project is as part of the Museums eLearning strategy to support the new Digital Technologies curriculum. Movies may be conceived as either documentaries or creative story-telling – like those featuring performance artist Mika in their current exhibition, Wonderland: The Magic of the Rose. Competition finalists will be showcased online and all contestants will be invited to an awards evening on Sunday, 20 June. Entries will be judged and prizes presented on the night by stars of the New Zealand film industry. As is its style, the ENZB, Early New Zealand Book project, at Auckland University, has been quietly adding 115 new books over the last year, with 65 of them coming on stream since the end of November, 2009. Their style is definitely no fuss - no big drama - and when they feel like it, making a discrete post to the local web, and/or mailing lists, as in this morning on NZ-Libs. 1940 - Mathew, Felton. The Founding of New Zealand: The Journals of Felton Mathew, First Surveyor-General of New Zealand, and his Wife, 1840-1847. 1839 - Fitzroy, R. Narrative of the Surveying Voyages of His Majesty's ships Adventure and Beagle [New Zealand chapters] [New York: AMS, 1966]. 1847 - Ross, J. C. A Voyage of Discovery and Research in the Southern and Antarctic Regions [New Zealand Chapters Only]. 1851 - Shortland, E. The Southern Districts of New Zealand: A Journal, with Passing Notices of the Customs of the Aborigines. 1869 - May, J. Guide to Farming in New Zealand. 1875 - Mundy, D. L. Rotomahana and the Boiling Springs of New Zealand: A Photographic Series of Sixteen Views. As luck would definitely have it, my eye immediately caught the Anthony Trollope item. Whether it be age, ot merely an eccentricity, I am currently half way through Trollope's Barchester Chronicles, having already spent most of this southern summer reading the Palliser series. As I think John Major, the ex UK Prime Minister once opined, he is a bit of an addiction once you get started. He is in good company here. Yesterday in Wellington, I finished Framley Parsonage, and wondered how I could possible wait until I got back to Auckland to start the next one , A Small House at Allington, which was sitting to hand at home. Musing aloud I thought fool! Clicked onto Project Gutenberg, and downloaded it courtesy of Air New Zealand Koru Coub wifi. Going back to the ENZB , for those who like this kind of detail - most of the new books are searchable PDFs, as well as in the ENZB favoured format, TEI-based XML The long-term goal is to provide these books in TEI-based XML as well as PDF. Cataloguing records for books in the collection are available from Te Puna. MARC records (UTF-8) are also available for download as a zip file from a link on the ENZB home page. The project uses b-engine software to convert TEI-compatible xml files to html for web display. This Friday past saw Moeed Ahmad, head of new media at Al Jazeera, speaking in Sydney at the Media 2010 conference about their network's repository of creative commons licensed content. Here in New Zealand, as I write at 11:30 am Friday, the Facebook group Save Radio New Zealand, now has 4,110 fans. The group didn't exist yesterday morning. People are signing up in droves because it has emerged in the last day or so that local broadcasting Minister, Jonathan Coleman has, since at least the November Radio NZ Board meeting, been making increasingly bellicose statements, both in public and in private, that Radio NZ needs to drastically cut its costs. Just what is being said by whom is becoming increasingly murky - but there is to be no more money in the years to come and the current annual budget of NZ $38 million will need to stretch indefinitely. That means the Board needs to find cost cutting measures, including the option of commercial sponsorship. It might also require the Auckland office to downsize. It could even mean stopping broadcasting at midnight - just like the old days. 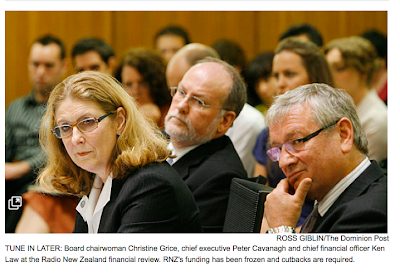 Matters went very public yesterday when Radio NZ Board chair, Christine Rice, was interviewed by the NZ Parliamentary broadcasting select committee. It emerged, as reported by some media , that the Board have already made plans to work towards the Ministers objective. Some select committee members were keen to hear more. The result was almost a slanging match as to whether some of the Minsters suggestions crossed the line into operational matters, as well as judicious quotes as to whether he did or didn't threaten to sack the Board if he didn't get his way. The media - especially the news- landscape in NZ is not deep - nor very broad. In terms of the primary players, it consists of the 3 regional newspapers, NZ Herald and The Dominion, The Christchurch Press, as well as the local TV companies, TVNZ and TV3 . All of the latter carry advertising. There are also a myriad of commercial radio stations, each of which competes to bombard you with advertising. Elsewhere, sponsorship is rampant. Radio NZ is different - no ads - no sponsorship - an old style public broadcasting radio station where a fierce, and occasionally leaden, commitment to balance is combined with a series of flagship programmes in the likes of Morning Report, Nine 'Till Noon, Jim Mora in the Afternoon. At the weekends, Saturday morning is still ruled by broadcasting diva, Kim Hill, with young Turks in the likes of Simon Morton jostling in afterwards. The culture is old school state broadcasting - the job is public radio - the daily grind all about finding the story - and getting people to talk about it. Everything is on the hoof - and all of it - especially Morning Report - annoys the living daylights out of all politicians - no matter what colour, because its the one place in New Zealand where the interviewer just might have read the report they are trying to bury. As for resourcing - ask anyone who has ever worked there - or walked through the door to give an interview - there is not a shoestring in sight. Indeed the last time I was in there - and sure they know my face - I made my way to Jim Mora's studio by auto pilot - tapped on the glass and walked in when he signaled the mike was off. No goffers - no green room - no production assistants - no nufink. They have a reasonable web site, which needs a lot of work to take it to the next phase. In its present iteration it just manages to keep up, but as anyone involved will tell you, it needs a re- design - a whole bunch of new tools to surf the social/semantic tide of web 3.0. The commitment is there - but again, there is no money, and even worse, very little appreciation at the political and governance layer that, given proper resourcing, there are people inside Radio NZ right now, who could take their web platform to a whole new level of international excellence. And for the record, I say that with absolutely no bias, or personal/professional interest whatsoever. Message to the Minster - more not less! Today, I am feeling a little more sanguine and almost grateful to Johnathen Coleman for provoking the debate. Because maybe its time, we started to take a long look at Radio New Zealand - and in the process started asking ourselves do we want to continue to support the last and lonely remnant of public broadcasting in NZ - and if so - isn't it time we signaled to its political masters - less isn't an option - what we want is more! Jonathan Coleman, the NZ Minister of Broadcasting contact details- including email and phone - can be found - here. The FaceBook group is here. Alternative broadcast models? The video from the BBC below is one - formulaic easy to digest info bytes - junk news - sponsored by junk food - aka Kentucky Fried Kim Hill. 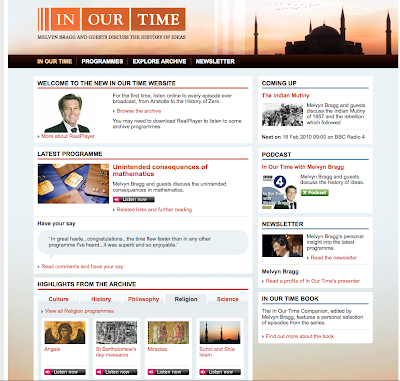 Melvyn Bragg's In Our Time from the BBC has a refresh - nice job! As part of my research for the Royal Society anniversary in the previous post, I discovered that the Melvyn Bragg, In Our Time, radio series from BBC Radio 4, has a new web site - or at least a design and information architecture refresh. It is very classy. Click the image above and have a look. Or go direct, here. If you do you'll find there are all sorts of improvements , including some feature programmes to each of the main categories - Culture, History, Philosophy, Science, Religion. Additionally, there is a lot cleaner comment option, newsletter sign-up - and of course, the prime new feature - a complete search and browse archive to the whole series. This is a significant piece of treasure trove. For those who have yet to find this broadcasting treasure, In Our Time, is build on the radical idea that there is still an audience, and indeed the expertise, to have expert panel discussions on topics in the fields of culture, history, science, religion, and philosophy, et al. I am also so leased to see a proper archive of the series.Hitherto, unless you got them onto your iPod or similar, you could never guarantee the audio from a previous programme would be there when you went back to look. Don't get me wrong iPods etc are very fine things. And given you could always download the MP3, there is every possibility that there are thousands of copies of all the programmes tucked away on hard drives the world over. That said, I still think there should be a proper archive of this type of material in the institution which created it. It would be even more reassuring to learn that key broadcast series like these were going to be preserved and made available as a cultural asset in perpetuity, as opposed to another set of disposable voices. And going one step further, I'm looking forward to the day when we can have a BBC open API to these collections so that we can use them within our own contextual learning spaces. My only critique would be in the search options, I can't search by contributor. If this sounds a little too much of the inner librarian, bear in mind, like others, I have some favorite contributors who appear in more than one programme. Jonathan Ree, the peripatetic philosopher at larger comes to mind for a start. But I mither. It's a lovely piece of work! Today had me, slightly unexpectedly, on air with Jim Mora on NZ National Radio. It was a little rough around the edges - as the audio will attest - but it did give me an instant chance to talk about some of the issues running around my brain since last weekend's Foo Camp - not least of which is how science and scientists can use online media to engage with citizens, as well as make sure the best of the scientific imagination remains front of mind. "a term used for projects or ongoing program of scientific work in which individual volunteers or networks of volunteers, many of whom may have no specific scientific training, perform or manage research-related tasks such as observation, measurement or computation. The use of citizen-science networks often allows scientists to accomplish research objectives more feasibly than would otherwise be possible. In addition, these projects aim to promote public engagement with the research, as well as with science in general. .."
SETI - the original one - lend your computer to a huge global experiment to find intelligent life in space. Galaxy Zoo - help map the heavens - much more centered on getting people involved in the experiment. NZ Royal Society now being enlarged by the inclusion of the Humanities Council. Means their focus has changed - now includes social and human sciences. Royal Society, UK is having its 350th birthday.
" Welcome to Trailblazing, an interactive timeline for everybody with an interest in science. Compiled by scientists, science communicators and historians – and co-ordinated by Professor Michael Thompson FRS – it celebrates three and a half centuries of scientific endeavour and has been launched to commemorate the Royal Society’s 350th anniversary in 2010. Trailblazing is a user-friendly, ‘explore-at-your-own-pace’, virtual journey through science. It showcases sixty fascinating and inspiring articles selected from an archive of more than 60,000 published by the Royal Society between 1665 and 2010. The State of Victoria in Australia has decided that all government information now be issued under the Creative Commons license. Very big deal for open government and online democracy - innovation etc. What's happening here in NZ? Should we go this way? Why does it matter. The status of the Creative Commons license in NZ as a default recommendation for government data and information is part of a discussion paper which has been widely circulated by the NZ SSC in recent months. The final paper plus cabinet recommendations should be in play in the next month or so, with potentially, some real progress on this by June. The videos from TED 2010 which went from Feb 9th to the 13th, 2010, are starting to surface. This demo by Blaise Aguera y Arcas demos new augmented-reality mapping technology from Microsoft is currently trending on Twitter. Definitively worth a peak. Still catching up from a huge last seven days. Monday, a week ago had me in Melbourne catching up with people including Angelina Russo from Museums 3.0, as well as a quick visit to NGV the National Gallery of Victoria. Then came three days at VALA , then back to Auckland on the Friday and so up to Warkworth just north of Auckland for Kiwi Foo - the annual meet-up of technologists - software architects/creators - scientists - media types - policy wonks and politicians from the NZ and international networks of Nat Torkington and Russell Brown. All of which needs sifted and separated - and just might provoke a couple of more measured pieces once I get time to process all of the inputs. But one incident/accident needs attention right now - and that's a huge shout out to the National Gallery Victoria for putting on the exhibition from one of Australia's long time own, Ron Mueck . Now based in London, and with a practice that goes back years, the exhibition show cases many of his classic hyper-real sculptures of the human figure, some of which are life size - some giants - and some almost miniature. Selections of these types are on all on view in this truly stunning and engaging exhibition currently running until 18th April. It then switches to Queensland until 1st August, before crossing the ditch to Christchurch Art Gallery from 30th September to 23rd January 2011. This sense of a community of emotions is heightened by the reaction of the people around you - who just like you did - bounce between the different works - then stand to one side - head to odd angles the better to see the works and hear them speak. For the record my favorites were , Wild Man - Baby and Two Women. As for Dead Dad - well what can I say - he looks so like I feel sometimes! You can get a flavour of many of the works on show from You Tube. There are lots of others on You Tube - just keyword Robert Mueck. Below is one of the You Tube videos. Many of the works in here are on show in Melbourne. More details on that at the excellent VGA web site , here - while Wikipedia has this to say about the artist, here. Jamie Oliver at TED 2010: Teach every child about food! LSE Literary Weekend - How Would a Robot Read a Novel? Don't judge a book by its cover? Don't be ridiculous. We constantly make judgements on books – from where it appears in a shop, its pretty cover, its heft or subject matter, the praise and criticism we hear about it. Reviewers are even more prejudiced. They know the author, or hate the publisher or, even worse, are a meticulous and lucid expert on the subject. All human readings are subjective. Is there another way? Would an objective reading - some preconceptionless robotic analysis, for instance - be preferable? Is it even possible? And what questions might a robot help us answer? Event Posting: LSE Literary Weekend - How Would a Robot Read a Novel? "Half a century after C. P. Snow's two cultures, the arts and sciences remain distinct domains. While the social sciences might have built bridges, they each continue to occupy a space of their own. This festival aims to push those boundaries, exploring the edges of social science and asking what can be learnt in the borderlands between social science, natural science and the humanities about mind, self and society. " He was brilliant - even if his jokes didn't load. Apparently there is a paper somewhere? Perhaps? Or maybe its still with the VALA lawyers? Conclusion? Evey library needs a Paul Sutherland - but I doubt if you could fork him - at least not without consequences for the space time/continuum. See - its contagious! This is interesting. Sitting in a session on Lib 2.0 from Michael Stephens, Dominican University, USA, Richard Sayers, CAVAL Ltd, and Warren Cheetham, CityLibraries Townsville, Qld on the results of a big Australian survey on the Lib 2.0 programme - aka 23 Things. First up - big ups to the tech, because in contrast to yesterday, it works - we are listening /watching Michael Stephens on Skype and watching a shared Powerpoint session. There is also a web site which is worth checking out- which includes this video and a whole bunch of stuff on the research. The inimitable Roy Tennant from OCLC has just finished a really good presentation on - API's , Linked Data, and the Cloud. This session follows neatly on from Tom Taque yesterday talking about Open Calais and the wonderful world of linked data. The new black for librarians? I help things along I thought it might be useful to put up this classic his masters voice - aka known as Tim Berners Lee on linked data. The first day of VALA 2010 was a lovely combination of the familiar - and look what's coming over the horizon - and are you ready to play. In the first category, Karen Calhoun of OCLC gave a really good benchmark session on where the global library world is in terms of sharing and extending their participation with the emerging learning and local web. She concentrated in the main on current OCLC products and plans - with an extended pit stop to explore the growing range of World Cat as a global gateway to the worlds library collections. I like World Cat - or should I say I totally adore the idea behind World Cat - to bring onto the users contextual desktop the combined holdings of library land - especially public library land. Among the many use cases for such a tool, potentially, it offers the web searcher a straight line to their local public library shelf. Need more? Imagine making a search on a topic on Google, Bing, et al, and among the results you get are links to books in your local public library, which when clicked takes you to the library record page and, if you are a member, the option to take the book out and have it sitting waiting on the shelf for you to come and get it. World Cat does this - or almost. It does it by having relationships with library holdings in 112 countries. Some of these - like New Zealand - have formal contracts with the National Library, and so direct routes to the national holding catlalougue. In short - this puppy can scale. It also has a potential to be the world library catalougue for global library land. Right now it's fair to say most of the effort is still in the plumbing - with the user experience playing catch up. Take this example - I went there and searched for Anne Salmonds recent and downright brilliant Aphrodite's Island. WorldCat knows about it for sure - here - but it doesn't know where I live so I have to tell it - saying Auckland doesn't work - it wants New Zealand - but there is no way you can know that - whereas a simple world map image- like changing the time zone in a MacBook - would sort that in seconds. When it does catch up with where I am , its great - it shows me the public and university New Zealand libraries which hold the book. 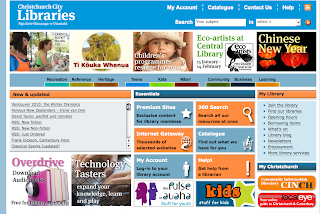 Picking Auckland City Library I can get there - but again, I've got to log in and then make my request for a hold. So it all works - sort of - which is why I said I love the idea of World Cat - but it still feels like a long way to go before it feels easy - seamless - and proper web like. And I doubt it wee Abbey - see yesterdays post below, would be all that impressed by all the stuffing around. Going the other way direct from Google or Bing needs even more work - which is a polite way of saying that World Cat is invisible using this route. Thus a search on Google for Aphrodite's Island offers heaps of sources - but only one library result on the first screen - the Australian National Library, here . Apart from a fantastic tour of the building by NLA s Director, the gift of a Picture Australia USB stick [always declare an interest, especially in Australia] - and being hosted to a meeting containing a brilliant vegetable curry- I have no relationship with the NLA - so the reference is no use to me as a way of getting my mits on the book. But wait - switching to Trove - their all singing dancing new federated search tool - TROVE - brings back a wonderful set of sources, here .Which begs the question how come Google knows about the catalougue entry and not the Trove page? That said, Trove is a brilliant example of context in motion. All of which is a neat switch to Tom Taques presentation on Open Calais and the challenge and opportunities around building the semantic web - or as he puts it , the contextual plumbing to sorting the wonderful vibrant but essentially unusable current web. These opportunities are of course around content and context - i.e. 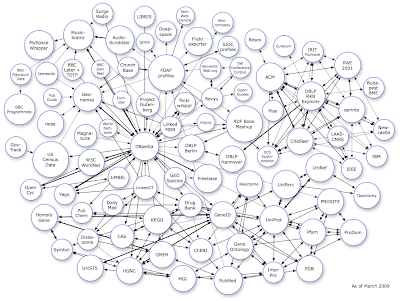 creating metadata software which makes instant rich and extensible concept maps of information showing linkages and conceptual contours. Open Calais is one of these tools. It is a free to use includes an open API] and when you give it some of your content, categorises it, returns name entities, and attempts to construct a facts and event framework. You can use a version of the software on the site, here, as well as start thinking about how you can use it to enhance and extend the depth and reach of the metadata in a collection. And on that note - the good Mr Taque made a point of giving a shout out to the Powerhouse Museum who have already been playing in this space. For those looking for more on Open Calais, try here. And for sure, it is not for the faint hearted - but that's okay there are some wonderfully capable people at VALA who can cope and carry their own oxygen ! Curiously, and in a wonderful moment of transparency, Mr TT happily admitted that up to this point he knew very little about what libraries were doing in the semantic web space. He even more cheerfully opined he had until today never heard of either OCLC and World Cat. Among all the lovely quotes and insights from this first day at VALA - this is the one I am remembering - sounds like there is a lot of joining the dots to do - perhaps its time for library land to sharpen pencils! Well here's an interesting couple of dots - Karen Calhoun in her own blog reports from VALA and speculates on a suggestion that World Cat be uploaded into Open Calais. On the declaration of interest with NLA - now I come to think on, I have two USB sticks from Picture Australia. Also, and I am totally chuffed by this, I am now the proud owner of a TROVE T shirt! Rocking. Going to wear it to Foo Camp NZ this weekend! VALA 2010, the big Australasian bi-annual conference has just started in the brand new Melbourne Convention Centre. The old one is next door, mothballed and silent, while the new one blushes in red paint and carpet. It reminds me of the Seoul convention centre without the basement city of shops. Melbourne is putting on a brilliant show. The weather is perfect - albeit a hot 35C. I arrived yesterday. I'm staying at the Hatton. Definitly worth your attention - boutique hotel in South Yarra - a tram ride to the arts precinct and Federation Square. The video above comes from the opening showcase. Great messages. Will be interesting to hear what the conference audience thinks about them. And, crucially, whose job it is to make them happen? The Victorian Government has become the first Australian government to commit to using Creative Commons as the default licensing system for its public sector information. 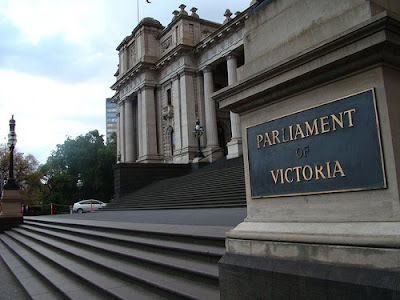 The Victorian Government endorses the committee’s overarching recommendation that the default position for the management of PSI should be open access. The Victorian Government further commits to the development of a whole-of-government Information Management Framework (IMF) whereby PSI is made available under Creative Commons licensing by default with a tailored suite of licences for restricted materials. As far as we are aware, this is the strongest commitment to Creative Commons implementation made by any Australian government. While there have been a number of excellent CC-friendly recommendations coming out of recent government inquiries - notably the Government 2.0 and Venturous Australia reports - these are yet to be officially adopted. 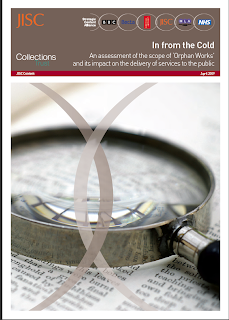 And while there are some excellent implementation projects - the Victorian Government specifically mentions the Australian Bureau of Statistics and Queensland’s Government Information Licensing Framework - these are still limited to individual agencies..."
The Collections Trust and the Strategic Content Alliance from the UK have published 'In From The Cold' - a report into the impact of 'orphan works' on public service delivery. Though focused on the UK, it is of real interest to the rest of the sector, specailly down here in Australasia. So what's the fuss? Orphan works - or works still in copyright but with no known rights holder on record - are one of the banes of any collection institution - library, or indeed publishers. And as is know, it is one of the key issues which will eventually make or break the Google Book deal. I have no idea what the New Zealand or Australian figures are, but I suspect they are no better. Turning to the effect - the report is clear - " access to over 50 million items held in trust by publicly funded agencies such as libraries, museums, archives and universities are being prevented from being available online due to current copyright laws"
This means that millions of so-called ‘orphan works' - photographs, recordings, texts and other ephemera from the last 100 years - risk becoming invisible because rights holders are not known or easy to trace. I had my first session of the year on the radio with Jim Mora at National Radio. The audio is above - its around 22 minutes. We covered a lot of ground. Herewith the running order and the links. These should also appear on the Radio New Zealand web site in due course. If you want a clean audio file, try these, Ogg Vorbis MP3, or go here. New Zealand web conference - recognised as the best conference in New Zealand for web - web design - and web projects . They bring in 25 of the best speakers on web in the world. Hugely popular with the NZ web digerati. New addition to WordPress - the open source blogging tool which also has a mile of independent developers and designers contributing new tools, designs and services to the common pool of 'plugins' to the main build. Some of which you pay for. Buddy Press gives groups a tool to make multiple blogs. Very good tool for organisations - and community groups. Needs a bit of know how to set up but not too much. So find a teenager who still knows everything. 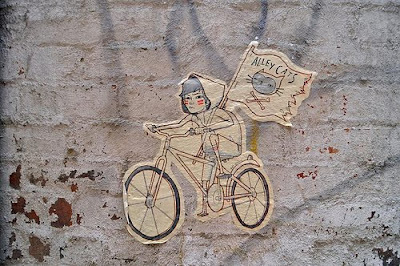 I have a mind to create a site and play with the idea of offering people a place to keep a Reading Journal. Library Thing is a great place to share your library collection - like a virtual book shelf. Then you can see what other people have on their shelves - share ideas etc.
" Legacy Library, that of Pei te Hurinui Jones (1898-1976). Jones joins Alfred Deakin (the second Prime Minister of Australia) in our Antipodean Legacies collection. Mr. Jones was a leading Māori scholar and translator (he's known for translating three volumes of Māori chants and song-poetry into English, and three Shakespeare plays into Māori). You can read a more complete biographical sketch on his profile page. ..."
Note: The University of Otago Library did a lovely exhibition last year featuring the library of Charles Brasch. It would be good to see Brasch's library become one of the legacy libraries on Library Thing. Great project that involves 20 UK Museums and Wikipedia. Involves the likes of Victoria and Albert and the Preston Grange Museum which is in Prestonpans, my home town. People go to the Museum - take photographs of their favorite things - or at least the ones which it is okay to photograph - and then post them to Wikipedia. Great example of crowd sourcing. Similar idea in the USA called Wikipedia loves Art was hugely popular. Report from New Zealand Computer Society claims that "A computer-savvy New Zealand could increase workforce productivity by $1.7 billion per year "
The session mentions the APNK - Aotearoa Peoples Network Kaharoa, a couple of times - especially as a place to extend digital literacy. Is this real? No idea. But definitively interesting. Chrome feels like Google's long term game plan. August 2008 -- August 2009" D-Lib Magazine 16(1/2)(January/February 2010 http://www.dlib.org/dlib/january10/holley/01holley.html. ".. Holley reports on the experience of the Australian Newspaper project with regards to user tagging. The project also includes the ability to correct OCR'd text, but this article focuses on the tagging aspect. The article includes a great deal of data on user tagging over a 15-month period, as well as interesting insights into how users tag full text collections. Of particular interest to me was when the National Library of Australia did not impose any tagging rules or guidelines "they clearly developed their own unwritten rules." In summary, Holley writes, "The experience of the National Library of Australia shows that tagging is a good thing, users want it, and it adds more information to data. It costs little to nothing and is relatively easy to implement; therefore, more libraries and archives should just implement it across their entire collections." Highly recommended for anyone interested in tagging, or indeed any type of user-contributed content. - RT ..."
Paul is an Auckland based commentator and thinker on the impact of digital technologies on cultural, heritage, learning and knowledge networks. He puts a strong emphasis on how communities access and contribute to knowledge. Paul is the co-founder and Joint Managing Director of McGovern Online, a full-service on-line media company who, since 1995, have provided strategy, design and development in the field of new media and Internet to clients in New Zealand, Australia, Fiji and the UK. He is an elected board member of the NZ National Digital Forum. He consults on digital strategic planning to a number of cultural and heritage organisations and institutions in New Zealand and Australia . He guests on NZ television and radio and is regarded as a engaging conference speaker. This blog is licensed under a Creative Commons Attribution-Noncommercial-No Derivative Works 3.0 New Zealand License. Note: images and video have seperate rights.